Eighteen months on from his debut in ‘Standstill’, Danny Felix is living the quiet life in the Florida Keys. He’s pretty much off the grid, working under an assumed name as a charter fishing skipper. But trouble follows Danny like nightfall follows sunset and an incident in a convenience store brings him to the attention of Monroe County Deputy Sheriff, Amparo Sosa. The tall Brit just has the feel of a ‘bad boy’ to her, and perhaps her interest might not be completely business-related. Here is a story that touches on how separation of state and church is a mockery in the America. Money is what drives some of these Bible-waving uber-zealots, by assuring their followers that theirs is the ‘one-true-way’, appealing to their basest fears, ignorance and prejudices and promising them a ‘Cadillac in Heaven’ for a healthy monetary donation. This thread is striated into a rollicking tale of drug money laundering, double dealing, double-double dealing, old enmity, new friends, revenge and the need to accomplish a seemingly impossible heist. I will say that, whilst the author has certainly skewered the TV evangelists, he also takes the time to show that this worship of Mammon is the reverse of what many good people are doing, and accomplishing in their communities today and gets a round of applause for lending some balance, whilst at the same time throwing even more shade on the Cardell clan. You get a solid sense of place as to the location - Florida Keys and the banter is authentic and quick-witted. There are delightful references to movies and music, with the narrative unravelling with speed and urgency. I’m not one to use the ‘page turner’ epithet very often, but I had this nailed in a day and it was worth every snatched minute. If you haven’t read John Marley’s debut, ‘Standstill’, do yourself a favour and make Danny Felix’s acquaintance. 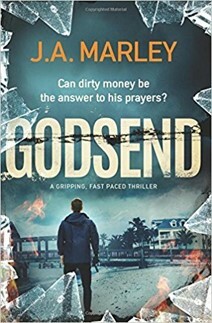 Then move on to ‘Godsend’, where the author had definitely upped his game.